Open Division: any show choir from a junior/middle school or community based group with junior/middle school-aged – mixed, girls only, boys only – compete against each other. Non-Competitive/Showcase Division: for schools and community groups with new and growing programs. These groups will participate in the excitement of the Championships without the added pressures of fielding a competitive set. Schools in this division will perform a minimum of two contrasting pieces to an audience of supporters and fans and receive valuable feedback from our judges. However these groups will not be scored nor be eligible for awards. Junior/Middle School Show Choirs and Community Groups with students up to Grade 8 will be eligible to participate. First 8 choirs to register will compete. Registration closes January 31, 2019 or when the schedule is full – which ever comes first. The final number of choir and band members will need to be submitted at this time. An invoice will then be issued for balance of fees owing, payable by April 1, 2019. Twenty (20) minutes will be allotted for each group’s performance. This includes set-up, performance and tear-down. A penalty of 10% of the overall score will be applied for exceeding the time limit. Show Choirs should perform a minimum of three contrasting compositions, including one ballad. Movement during the ballad should be kept to a minimum. There will be a five-minute on-stage critique by the adjudicators following the teardown. It is recommended to have a maximum performance time of 10-12 minutes in order to allow adequate time for set-up and tear-down. We encourage schools to keep the performance material age-appropriate and family-friendly. Recorded instrumental accompaniment tracks are allowed. Groups with multiple tracks should consider editing them into one single track (with suitable transition times inserted) so that the track can be started and left to play right through to the end of the performance. It is always advisable to bring a back up on a USB stick. 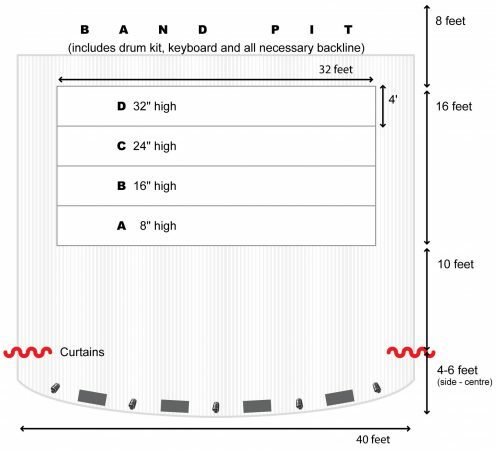 Bands will set up on stage behind the risers. Show Choir Canada will provide a drum kit, keyboard and all other necessary backline TBD. Choirs may bring their own keyboards if they wish. The following awards will be presented at the Junior Show Choir Championships. Please have two representatives from your choir in costume on stage to accept the awards. Three adjudicators who are industry experts will evaluate your performance. Adjudicators will provide a five-minute, on-stage critique immediately following each performance. A copy of the newly adopted adjudication form, along with the judges verbal comments with Video Judge will be given to each choir director. Once again we will be implementing the following scoring system and Video Judge. We take great pride in hiring fair, competent, unbiased adjudicators.